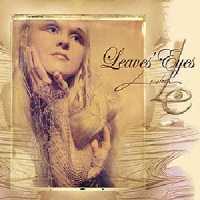 The debut effort by Leaves' Eyes is breathtaking. Featuring members of Atrocity (whose most recent album is titled Atlantis) and led by Liv Kristine Espenæs Krull (Theatre Of Tragedy), Leaves' Eyes blends facets of gothic metal (most notably darkwave) with bombastic, atmospheric, and melodic heavy metal. What Lovelorn lacks in aggression and brutality, it more than makes up with intense beauty and a tint of the melancholy. A concept album, Lovelorn consists of 10 chapters, the first of which is Norwegian Lovesong. The composition is heavy, with the percussion and guitars making a solid appearance. Offsetting the heaviness are sweeping vistas provided by synthesisers and, of course, Kristine's fairy-like voice. Tale Of The Sea Maid incorporates the catchy, dance-oriented rhythms of darkwave, but does not go to the extremes of, say, Theatre Of Tragedy's Assembly, with Liv and company instead using the rhythms to create a seductive state of melancholia. Ocean's Way is the first time we hear Alexander Krull's death metal growls (Krull fronts Atrocity and also produces), which serve as a counterpoint to Liv's high-pitched croons. The music on this track is heavily influenced by classical orchestration, and the band relies heavily on synthesisers to achieve that sound. The title track enables Liv Kristine to shine, with the music pulling back and allowing Liv to showcase a more operatic style with equally enchanting background vocals. The Dream starts off with some Gregorian-styled chants and strings, and then breaks out a catchy darkwave rhythm with some excellent percussion and several subdued but effective guitar riffs. Krull's death metal growls once again make an appearance, and they work well against Liv's enchanted voice - indeed, the growls make her voice sound even stronger. Next up is Secret, a lovely, violin-driven melody that also showcases Liv's operatic prowess, in addition to her more serene singing voice, and then there's For Amelie, a piano-driven ballad that has Liv experimenting with a more mainstream voice that works well. Of all the songs, this is the one that comes off as the most 'poppy', down to the crunchy, rock 'n' roll guitar riff. Perhaps the heaviest track of the album is Temptation, which has Kristine's voice altered into a raspy growl for a couple of verses and also features Krull's signature snarls. The percussion is more intense, as are the guitars, giving this track a Faustian edge. Clocking in at less than six minutes, Into Your Light taps into darkwave to create an upbeat, melodic composition that also shows off some middle-eastern rhythms, and the closer, Return To Life, ends on a high note sure to get the blood pumping. The guitars on this song are very good, particularly the solos. Grounded in nature and beauty, Lovelorn will appeal to fans of gothic metal and melodic music in general. The musicianship is exemplary, the production solid, and the combination of Atrocity's sweeping keyboards and hardened guitars with Liv Kristine's luscious voice is simply amazing.